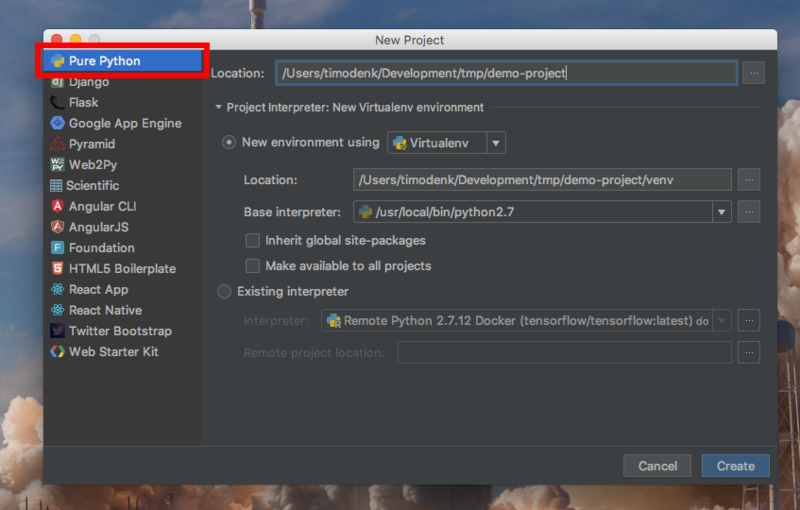 This guide walks you through setting up PyCharm Professional and Docker, with the goal of developing TensorFlow applications in PyCharm, while executing the code inside of an encapsulated container. 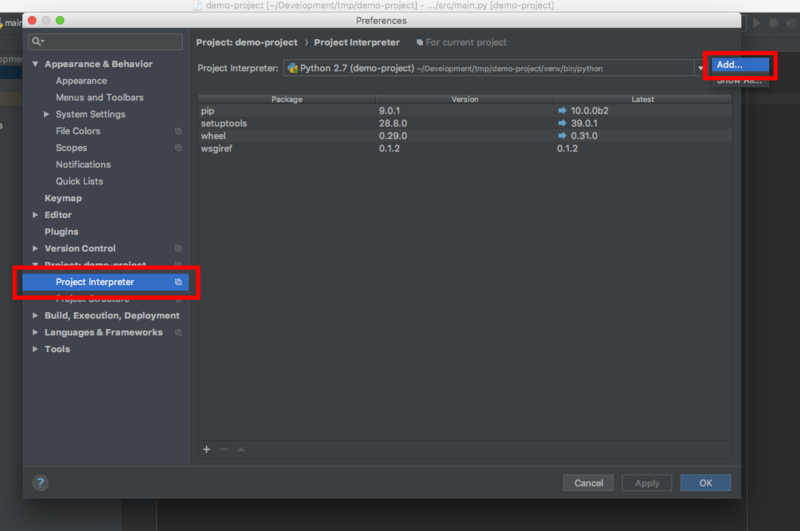 After completing the following steps, you will be able to write Python code in PyCharm, and have the execution take place on a container, without any complication. Prerequisites: Docker and PyCharm Professional (the Community Edition is not sufficient) must be installed. 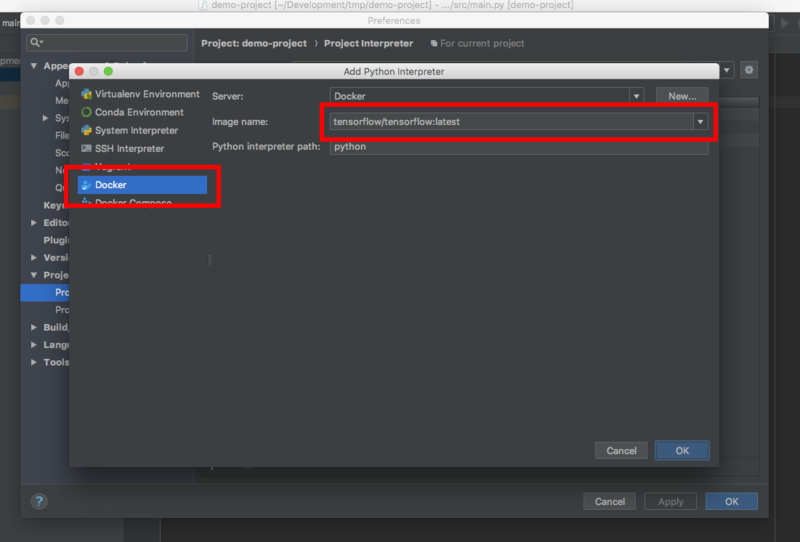 Open PyCharm and create a new “Pure Python” project in PyCharm. Leave the interpreter as-is, i.e. “New environment using Virtualenv”. PyCharm will complain, saying “No module named tensorflow” (unless TensorFlow is set up on the host machine). Select “Docker” and go with the image “tensorflow/tensorflow”. The “No module named tensorflow” error should now be gone. 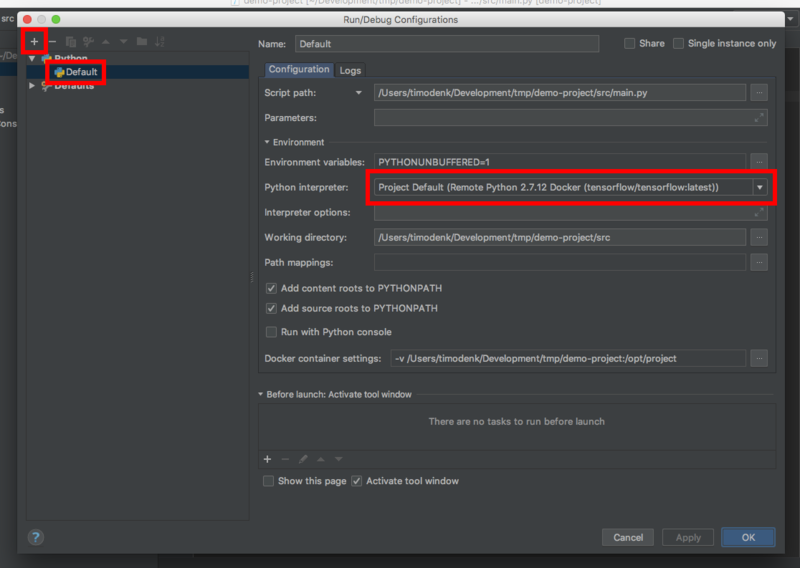 PyCharm starts a Docker container in the background, whose python binary does the type-checking. Add a new Python run/debug configuration, where the Python interpreter is set to be “Project Default (Remote Python 2.7.12 Docker (tensorflow/tensorflow:latest))”. Set the values “Script path” and “Working directory” as needed. Hit the “Run” button and the console will output “Hello, TensorFlow!”. Debugging works as well. Now how do you do this with GPU support? 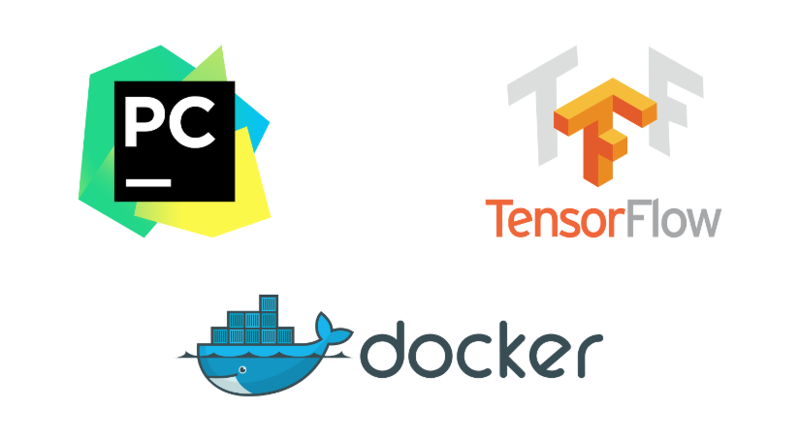 I would suggest using the Docker image tensorflow:latest-gpu-py3 (all available tags are listed here). Consuming GPUs in containers is currently only supported on Windows/Linux, due to nvidia-docker. 2) Make sure the current user is in the usergroup ‘docker’, otherwise you’ll need sudo to do things with Docker, which can be avoided. 4) You may now access the GPU from the container, but keep that in mind that Tensorflow still needs compiled CUDA libs. You error is being thrown because somehow it cannot access it. This might solve the error. Great tutorial, thanks for sharing this! I can run tensorflow in docker, as per your tutorial using python 2.7. But, I need to run it using Python 3.6 in a virtual Python environment. 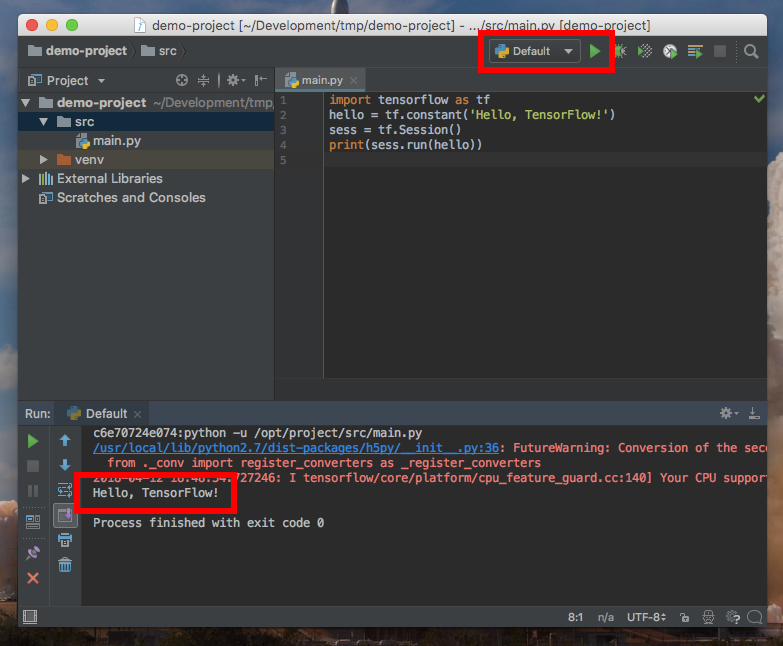 I have created a python virtual environment in my PyCharm’s root project folder, in the sub-directory named “venv”. Would I just add the the path to the virtual environment’s python executable to get this to work? Create a virtual environment on your host and use it as the interpreter (what you did; also, have a look at anaconda https://www.anaconda.com/). Create a Docker image where there is a Python environment with TensorFlow (https://medium.com/@chadlagore/conda-environments-with-docker-82cdc9d25754) and use the executable inside the container as your interpreter.